It was a whirlwind last quarter of 2014 and I feel like I'm finally just catching my breath now. In looking back, I never got around to telling you about my end of year travel. 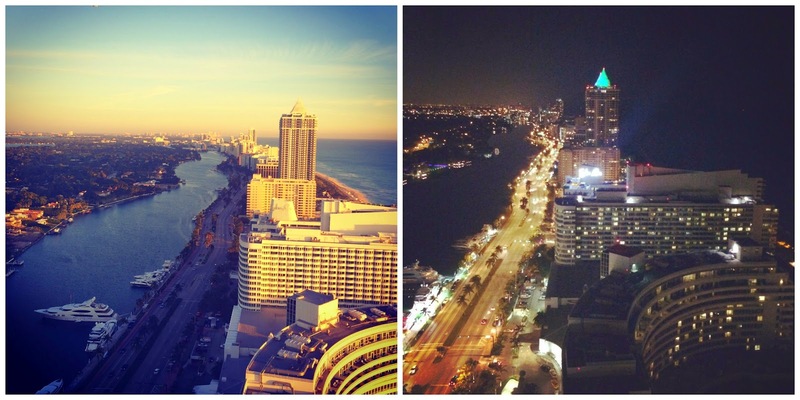 In December my company hosted a meeting in Miami and I had the privilege of staying at the famous Fontainebleau Hotel on Miami Beach. This gorgeous hotel originally opened in the 1950's and while it has been recently renovated, it still has that glamorous 1950s feel. The rooms are beautiful, the views are breathtaking, and the restaurants, of course, were nothing short of amazing. My first meal at The Fontainebleau was a quick lunch al fresco at La Cote. La Cote is a casual outdoor restaurant located directly between the expansive pool and the beach, so it's the perfect place for a little refreshment break while you're spending your time at either. I enjoyed a Caesar salad with a combination of radicchio and romaine, tangy Caesar dressing, and topped with huge grilled prawns. I did not, however, enjoy the local wildlife at La Cote. If you're not a fan of birds you may opt for another restaurant at the resort because they are all over La Cote and also very brave! Florida Snapper: Perfectly cooked fish served over crispy shrimp rice cakes made to mimic fried rice in a super flavorful and rich curry broth with touch of sweet pineapple. 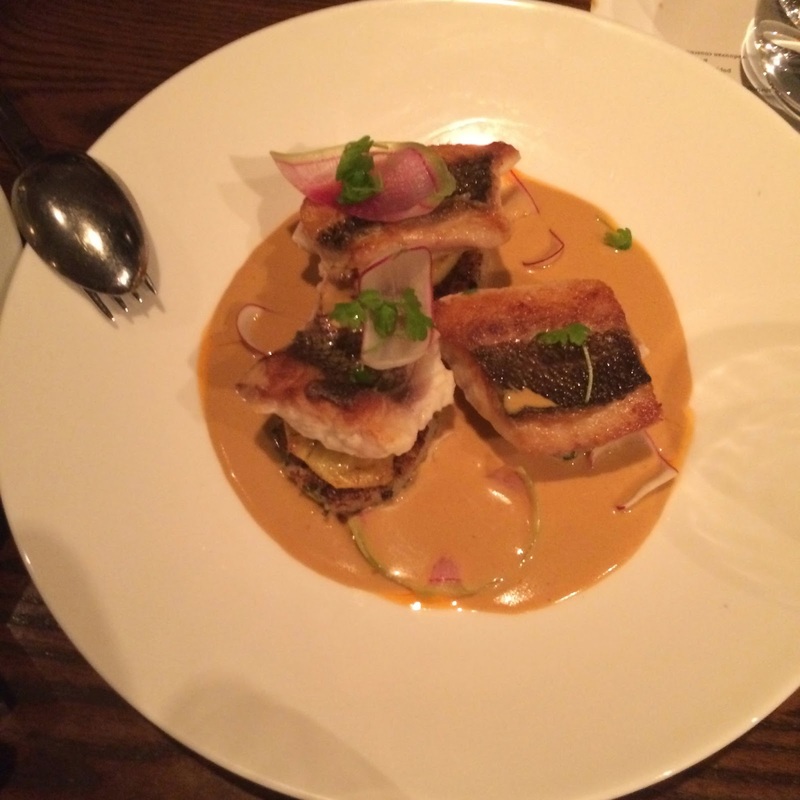 The flavors here were so vibrant and worked so nicely with the fresh fish. It felt like the perfect dish to eat on our first night in south Florida. 72 Hour Moroccan Shortrib: I love a good shortrib and this one was perfectly cooked to fork tender. Served with thinly shredded Moroccan-roasted carrots and Vadouvan couscous, this dish had that amazing bold and warm Middle Eastern flavor unique. Lobster Cavatelli: Last, but definitely not least, this one was by far my favorite. Sizable chunks of fresh lobster was served over cavatelli pasta tossed in a creamy and flavorful lemon beurre blanc with chervil and poppy seeds. The sauce was rich, but the lemon and chervil gave it such a bright fresh flavor. Hakkasan is a AAA Four Diamond Award winning restaurant with a super chic atmosphere and by far, the best Chinese food I have ever eaten. 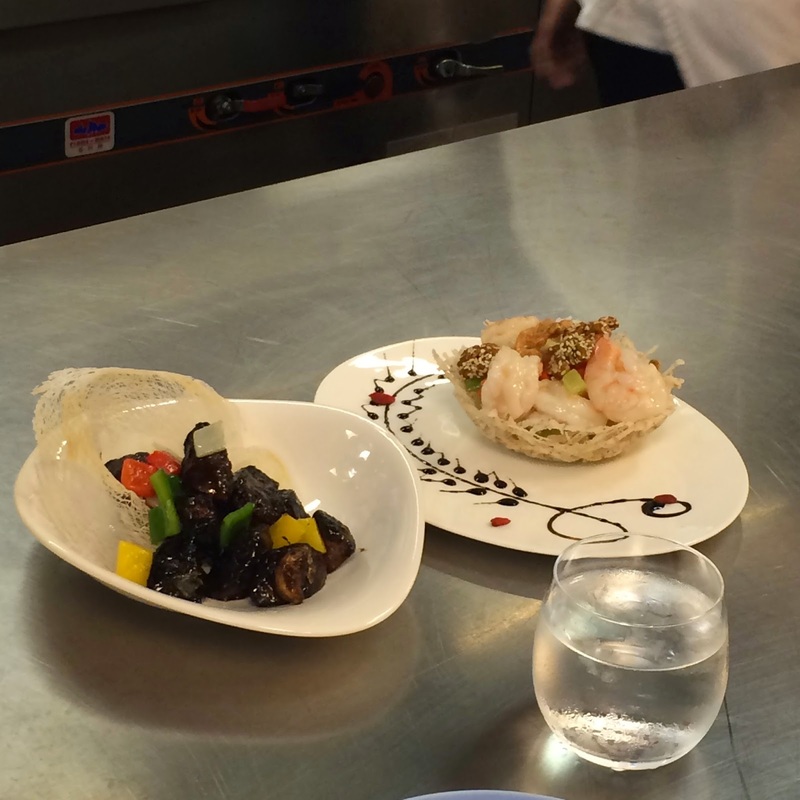 Our dining experience at Hakkasan was particularly special because we began our meal in the kitchen with their chefs for a hands on lesson in dim sum making. 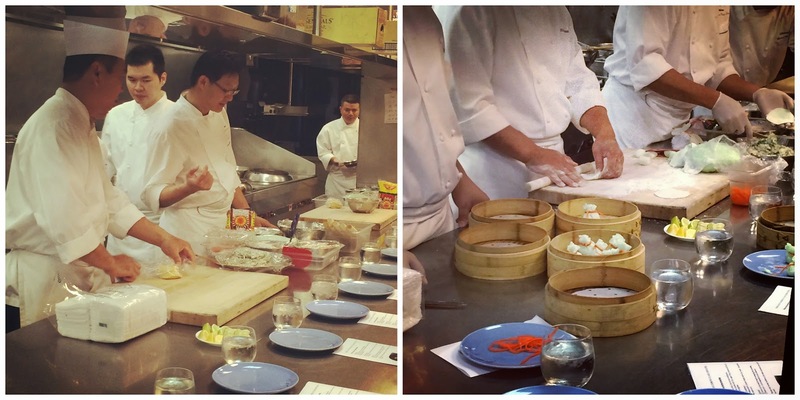 It was definitely one of the coolest foodie experiences I have ever taken part in and these chefs were amazing-- whipping out dozens of perfectly formed dim sum in minutes while the rest of us struggled to make one or two. The chefs then steamed it all up and the dim sum was served as a part of a huge Chinese feast that we enjoyed for lunch. We made two different kinds of dim sum during our lesson: Scallops shui mai-- wonton skins stuffed with a seasoned shrimp mixture, topped with a thinly sliced scallop, and then steamed. The second was a a wheat and potato "skin" stuffed with Chinese chives and seasoned shrimp. It looks like a little pouch and the top is tied off with a thinly sliced carrot before steaming. I could have made a meal totally out of their delicious dim sum. The little bites that we prepared were served alongside Hakkasan's other signature steamed dim sum offering, the pork shui mai. Other highlights of the meal-- which is tough to narrow down because we ate SO much here-- included the tender stir-fried prawn with lettuce root, dried shrimp and sweet walnuts and the super flavorful black pepper beef tenderloin served with crisp bright bell peppers. And I can't believe I didn't get a photo of it, but the traditional roasted half Peking duck is not to be missed! It was carved tableside and served with sliced cucumber, a sweet and savory hoisin sauce, and super thin pancakes for serving. Ordering this duck is an experience, to say the least. But the flavor is great and the skin was perfectly crisp. It is not to be missed! 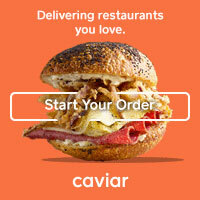 Burrata: I always love burrata, but this preparation-- a reinvented caprese salad-- was really special. 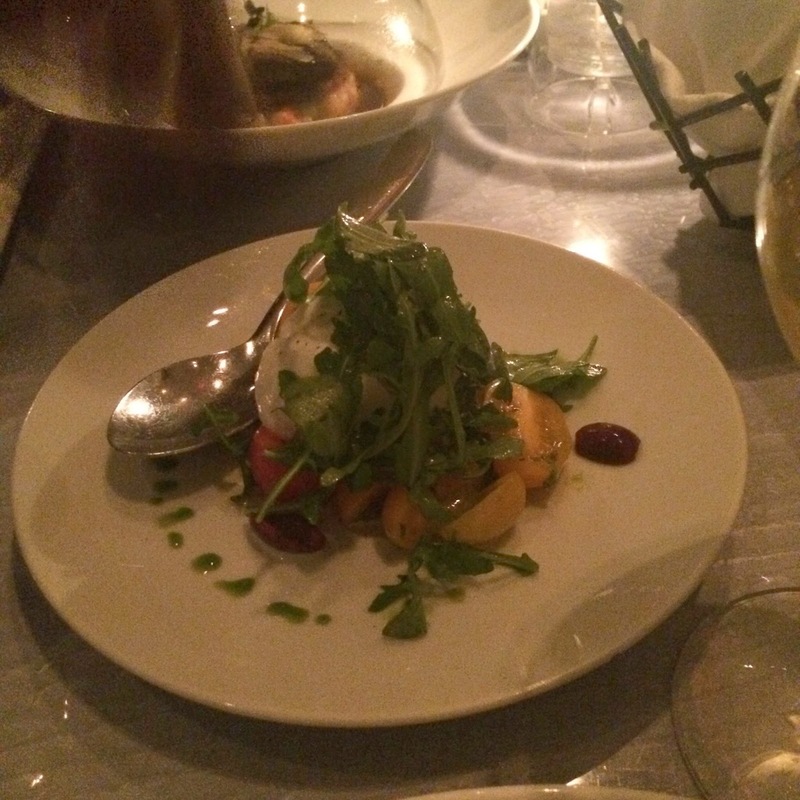 Creamy burrata was served alongside fresh heirloom tomatoes and a fragrant baby basil and arugula salad. The whole thing was drizzled with a flavorful broccoli rabe pesto. Spaghetti: So simple, yet so delicious. 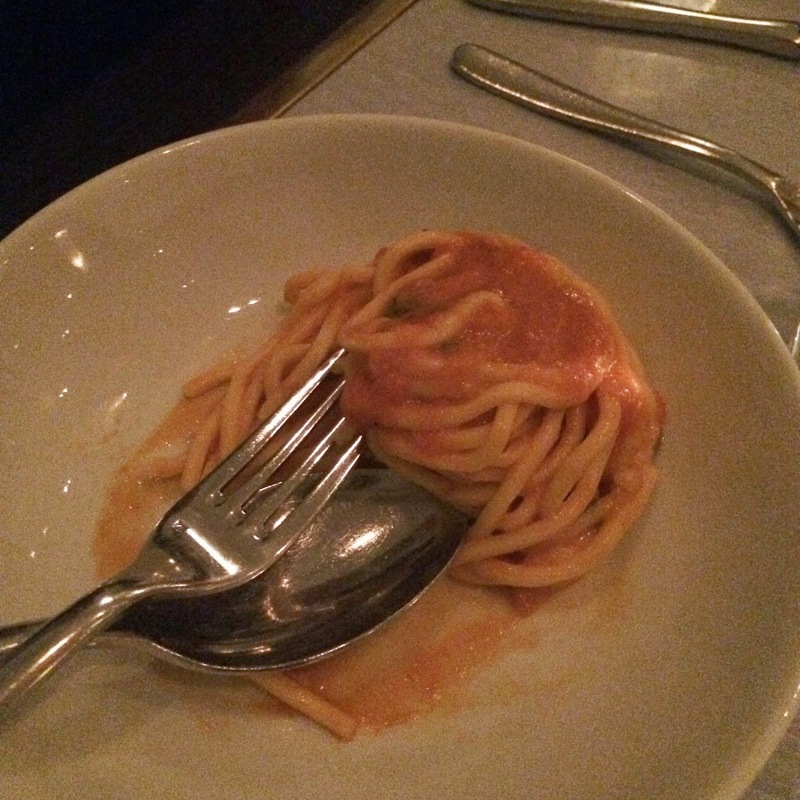 Housemade spaghetti with a fresh tomato basil sauce seems like a no brainer, but done right it can be really special. Everything here was so well done that I could have had a bowl of this and been completely happy with my dinner. Duck & Foie Gras Ravioli: Quite the opposite of the simple spaghetti, this homemade ravioli was complex and decadent. A rich duck and foie filling was stuffed into small tender half-moon shaped ravioli and tossed in an equally rich and flavorful marsala reduction. This pasta was really special and not like anything else you'll try at a run of the mill Italian restaurant. After a few days of eating a lot cheese, foie, and duck (see above) I was ready for something a little lighter at our last meal in Miami. We stopped into Vida, one The Fontainebleau's more casual eateries for lunch before heading to the airport. Vida is described as an American Brasserie and it's the perfect place for a good sandwich or salad when you want a sit down meal that's not super fancy like you'll find at one of the resort's Signature Restaurants-- just note that service is a bit slow, so don't sit dow here if you're in a time crunch. This quinoa salad with grilled chicken, fennel (which I don't usually enjoy, but I liked this woody charred version), zucchini, mushroom, avocado, confit tomatoes, and salsa verde was fresh, light, and satisfying-- exactly when I wanted! Another item to note about dining at The Fontainebleau is that they have a truly impressive dining program. After our big lunch at Hakkasan we had the opportunity to tour the underbelly of the hotel, which doesn't sound nearly as interesting as it actually was. The Fontainebleau's Executive Chef Thomas Connell led the tour and gave us great insights into what makes this hotel's dining program different from all the rest. One of the things that makes this program so unique is that all of the food and beverages served at each of the hotel's restaurants and in their catering program is sourced from one location within the hotel-- right in the underbelly we were touring. 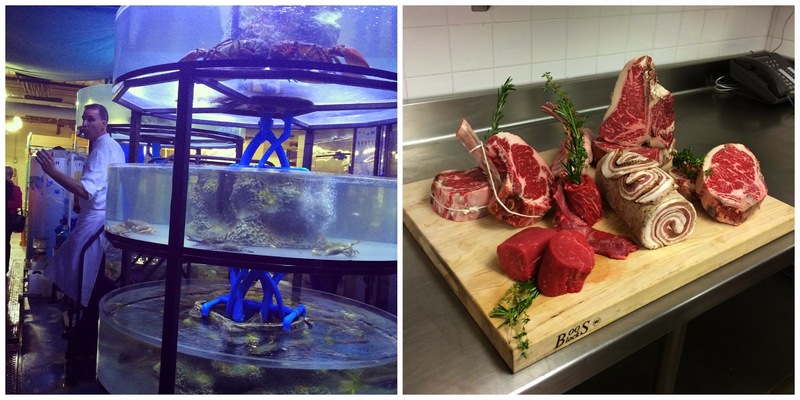 Chef Connell's team manages all of the inventory, coordinates with the kitchen staff at each restaurant, and the hotel even has its own fishing boat-- helping to promote the Fontainebleau's "ocean to table" seafood program. BleauFish provides almost all of the 500 lbs. of seafood that the hotel serves each day and the live catches are housed in salt water tanks that are each temperature-controlled for the species of seafood they house. That's some seriously fresh seafood. The hotel also employs professional chocolatiers and pastry chefs who create the highest quality confections, like the hotel's signature bowtie brownie. 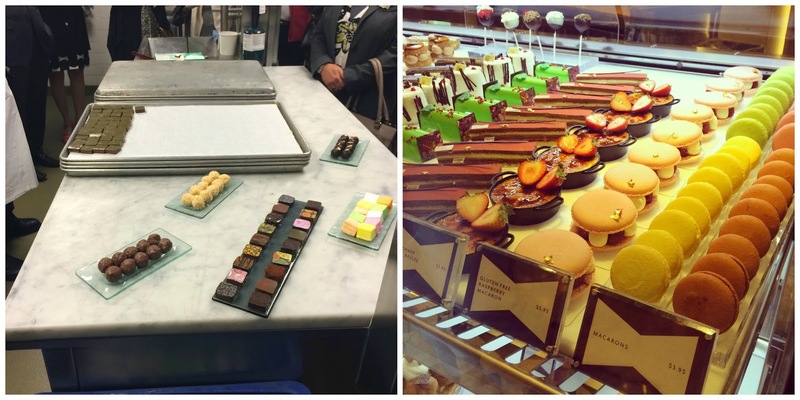 These treats including delicious truffles, French macarons, cakes, tarts, and freshly made gelato are all available in Chez BonBon, the hotel's cafe and confection shop. We had the opportunity to sample several of the hotel's truffles and a few gelato flavors too. One of my favorites was the exotic white chocolate truffle with fruit filling and a toasted coconut exterior. 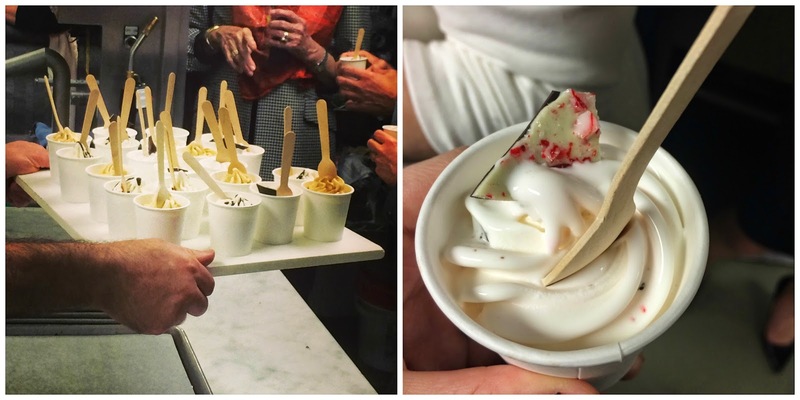 And I love all gelato, but since we were there around the holidays they were serving a festive peppermint bark variety that I had to try... and it was delicious! This is just the tip of the iceberg when it comes to dining at The Fontainebleau, but what an amazing place for food-- and for a fabulous travel experience too!